Happy anniversary to F. Eugene (Gene) Oswalt! On June 4th Gene celebrated 53 years of employment with Mansfield Plumbing and is our company’s longest-tenured employee. 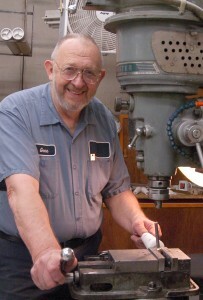 For more than five decades Gene has created a career at Mansfield, starting first in the tool room, then moving after 29 years to the brass tool room, and then, in 2007, to his current position as a case maker in the model shop. He has produced everything from plastic injection molds to jigs to capillary rods as the company’s most senior employee.